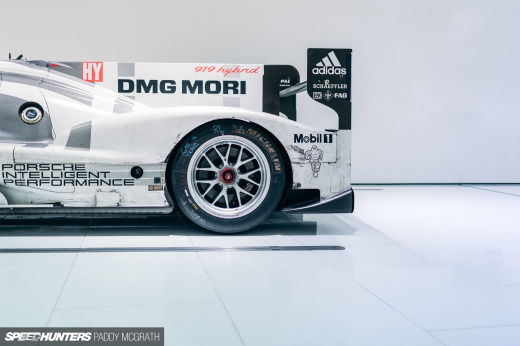 It's been a whirlwind month for the new World GT1 Championship following the series' mid-April debut at the space-age Yas Marina track in Abu Dhabi. 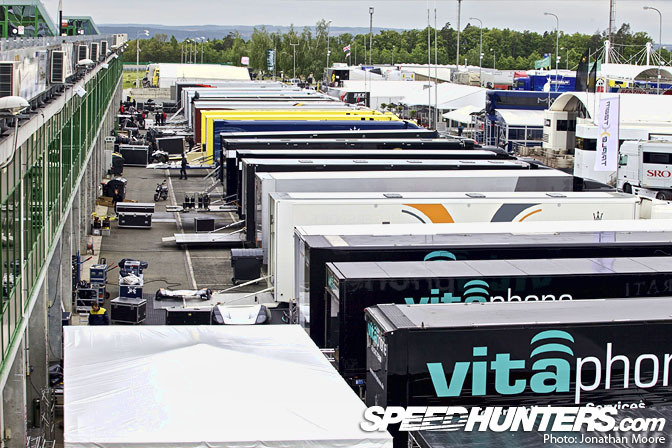 The subsequent stranding for almost a week of all the teams, thanks to the unpronounceable Icelandic volcano, meant that they had hardly got back to base before having to pack up the trucks and head for the second round at Silverstone in the UK. 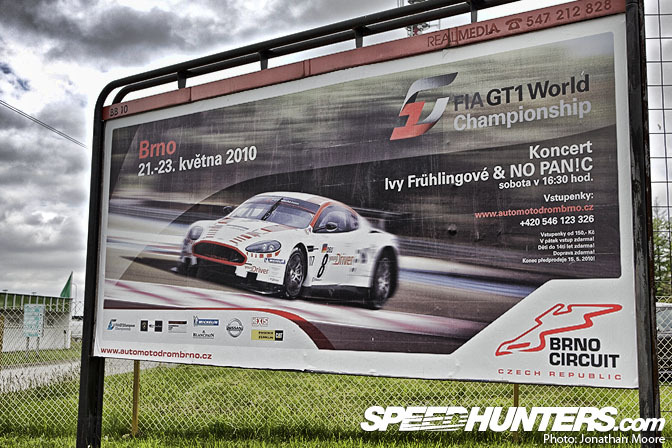 With only one weekend in-between, now the GT1 circus has moved back east again, to the Brno circuit in the Czech Republic. 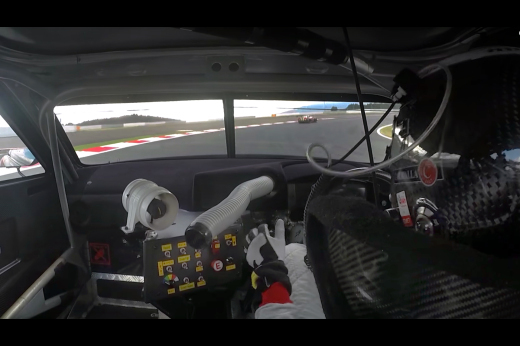 Sumo Power GT are riding high: the victory handed to the #22 car following penalties for the two Aston Martins who finished first and second on the road has been confirmed. Aston's appeal to the FIA failed, so Jamie Campbell-Walter and Warren Hughes' names will be etched onto the prestigious 105-year-old RAC Tourist Trophy. 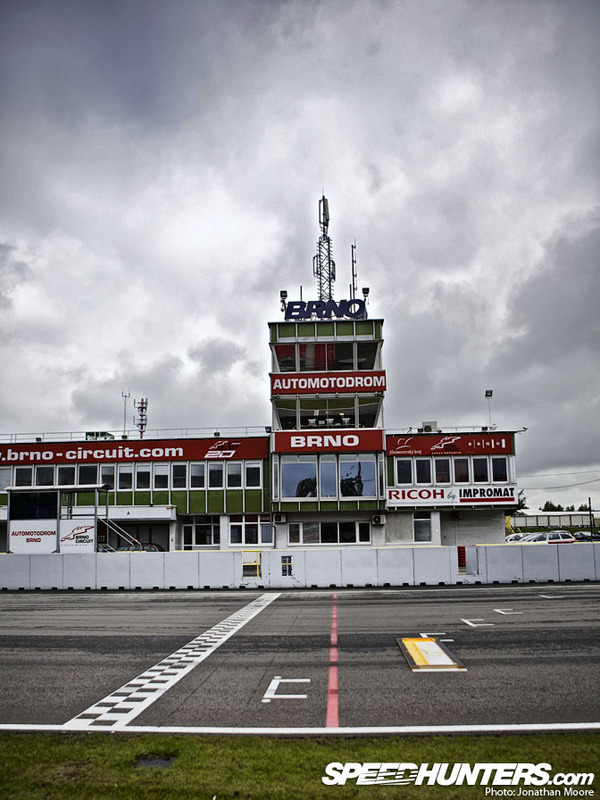 Brno is no newcomer to the the smell of petrol: 80 years of racing in the area attests to that. The track that the GT1 series will race on was constructed in 1987, but it is surrounded by an awesome 30km-long circuit that winds its way around the local roads. First used in 1930, the Masaryk track was shortened three times over the subsequent decades but still 11km long in its last iteration: I spent an hour this afternoon touring around this amazing old track – I'll be posting up a story on that later on. 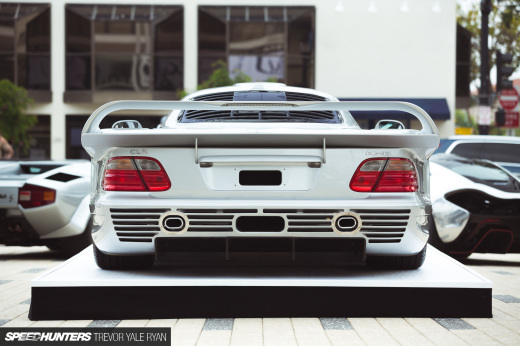 There have been more changes in GT1 since the Silverstone round. Firstly, some minor Balance Of Performance tweaks this time following the closer racing last time out: the Aston Martin DB9s lose 20kg but get smaller air restrictors. Also, GT1 rules mean that the top four finishers from the previous race all gain weight, which means the #22 Sumo Power GT Nissan GT-R is lumped with 40kg of success ballast. That's really going to hurt here, as the track is split into two clear halves: the first a twisty downhill section and the second a long drag back uphill to the finish line. The Maseratis have been allowed to move their ballast plates into the cockpit, as they suffered from fuel pick-up problems due to ballast pushing against the fuel cells. There have also been more driver changes: some still not confirmed even the day before practice starts. The grid had looked like being down to 22 cars after the horrific fire of the #14 Pheonix/Carsport Corvette Z06 at Silverstone – a single truck for that team shows that only #13 will roll out tomorrow. But better news from the Matech team, where the #6 Ford GT is back on track with a new partner for Cyndia Allemann. 24-year-old Rahel Frey, another Swiss girl, replaces the still recovering Natacha Gachnang. The good news is that Gachnang will definitely be fit in time for Le Mans, where she'll join Allemann and Frey in an all-girl, all-Swiss Ford GT line-up. The first thing I did on arriving at the circuit was to wander round the paddock and track: it's the first time I've been to Brno, so I was interested to see what kind of circuit it is. I've seen plenty of races on TV from here, and it looks like the complex of corners at the bottom of the track should be an exciting place to watch the cars: I'll get down there for practice tomorrow, and also have a better look around the further reaches of the 14-turn track. The architecture here is… of a time. It's got something of a faded glory look to it: what was state of the art (for something that was behind the Iron Curtain at the time as well, don't forget) now looks a little worn and overgrown, but it certainly doesn't lack a personality. 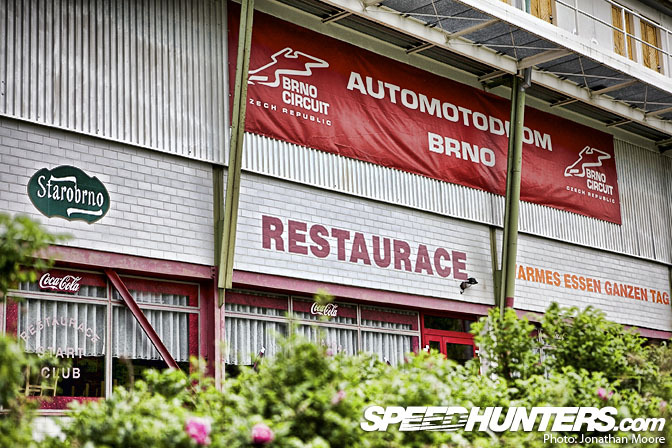 There are plenty of great vantage points around: Brno has a good reputation as a spectator's track. There are plenty of stands and also viewing banks around the edge of the track. How's this for the most exclusive stand though: your own three-seater – complete with its own transportation. 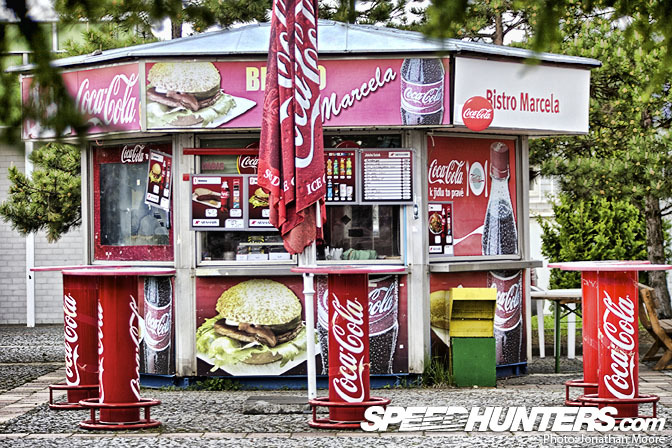 Just further down, opposite the start-line, is a larger stand; behind it was this vendor's kiosk, Coke red faded pink from the sun – a typical sight. 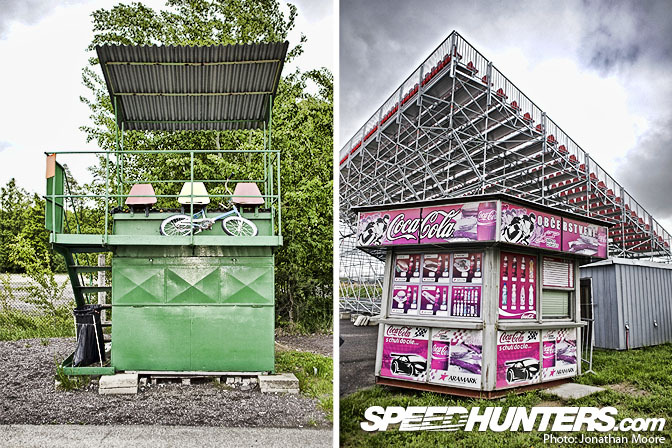 A quirky touch is the naming of the eateries at the track: they're all called 'Restaurace'! Being at a track when there's no racing going on is a strange experience. You can walk on the track, for a start: something I always feel a bit uneasy about. I always think that any second a car is going to come screaming round the corner at me. 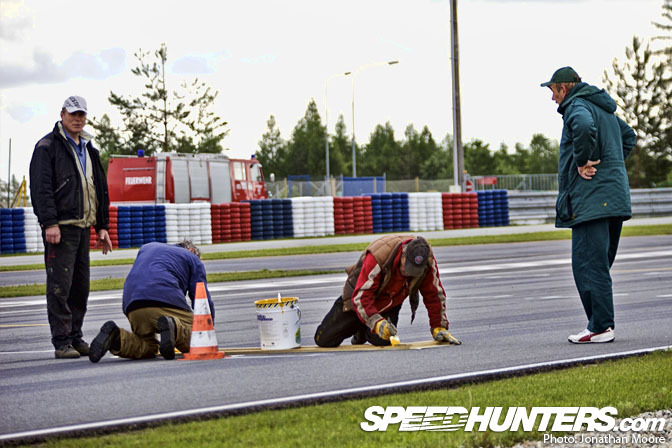 Luckily, no car problems for these guys, painting new yellow grid hatchings onto the tarmac. Back in the paddock, all the trucks were lined up and being unloaded. With the European rounds the teams carry truck everything to the circuits: cars, spares, garage interiors, catering, hospitality units and acres of plastic flooring. The Corvette teams were late arrivals, only pulling in this morning, whereas all the other teams where already lined up. This made things difficult for the Mad Croc Corvette team: one of their trucks needed a 20-point turn to ease it into the remaining tight space in the line between the trucks and hospitality units. Each team has its own routine for setting things up; most teams are still fine tuning the process – and will likely still be tweaking things all the way to the final round in December. For these European rounds the cars are secured in the top racks of the race trucks for transporting to the venues. First all the spares and garage units are unpacked from the lower lockers. Then the cars are wheeled out onto the flimsy-looking tail lifts, lowered down and pushed out into the garage. At this stage the whole paddock echoed to the sound of dodgy AOR from portable hifis and the sound of hammers as the custom garages-in-a-garage were assembled. 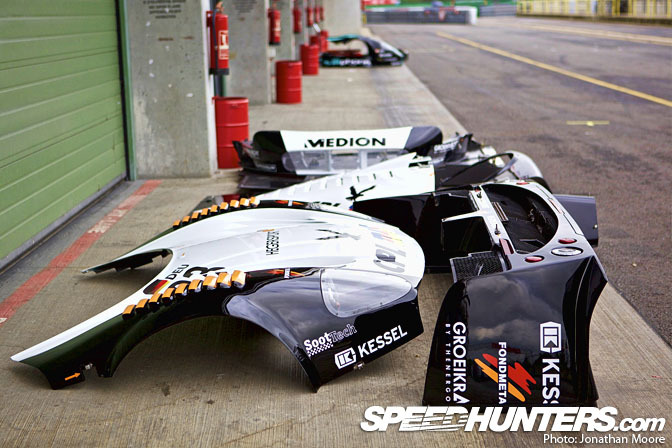 The Triple-H Maserati team had stripped down one of their cars to work on it: the constituent body panels were then laid out as a very expensive model kit in front of the garage. 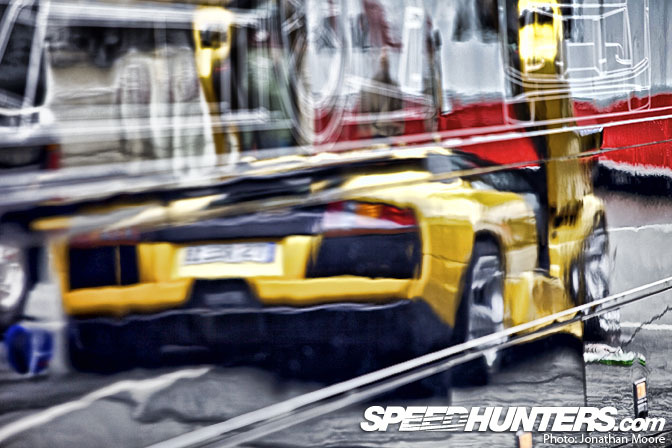 Reflected onto the side of one of the Reiter Lamborghini trucks was a rather special Reiter-tuned road-going Murcielago. It was being washed and fettled whilst the race cars sat waiting attention in the garage! I'll get some more details on this car over the weekend. Garages are never the same size from track to track, so there's always a lot of playing around to get your equipment and promotional boards to fit. The Belgian Marc VDS team pushed their Ford GTs out onto the pit apron to get them out of the way whilst the mechanics prepped the garages. All this has to be sorted before the team even get a chance to work on the car: you quickly realise how valuable every minute is, as there's actually very little time available in a packed race weekend. 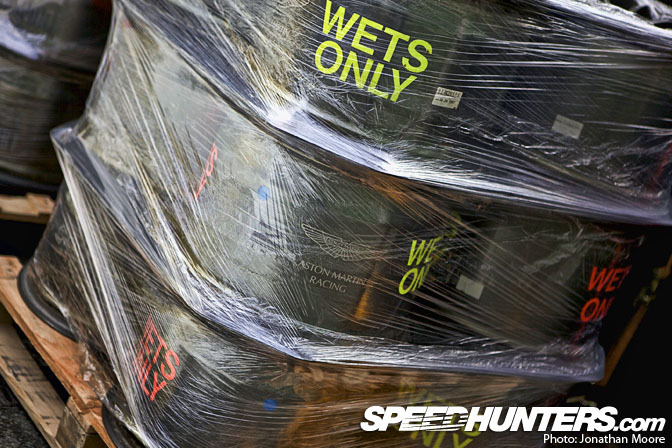 Out at the back of the Aston Martin pit was this palette of rims for wet running – fingers crossed they won't be needed. As the sun set, teams hurriedly finished eating dinner in their hospitality tents and made their way back to the garages. There was plenty of work still left to do before anyone would be seeing their hotel rooms. The first session is at 9am tomorrow morning, and the team will be here late tonight setting the car up and practising pit stops. It'll be a 5am start to get to the track, which is about 20 minutes out of Brno town: this will give the teams a brief chance to carry out final checks and set-up changes before the cars roll out of the garage and onto the track in anger. See you in the morning! 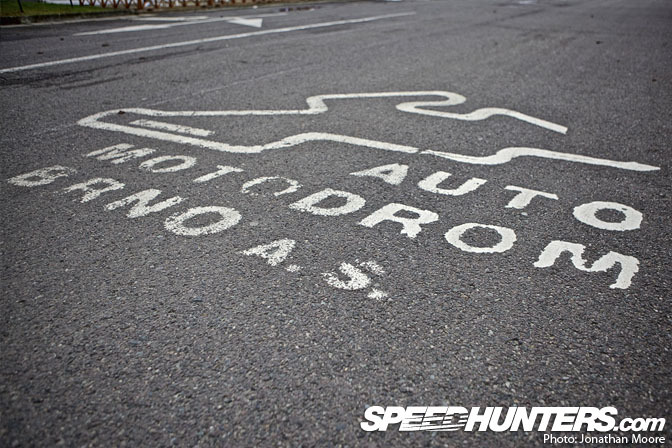 ill be in the paddocks on sunday, any chance of speedhunters stickers? Why would they have a separate set of rims for rain? Nice. 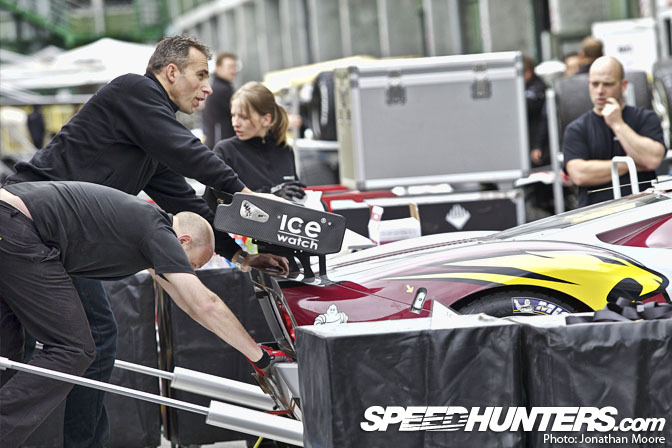 I saw the Reiter R-GT Street Murcielago at the Norisring too - it is incredible. 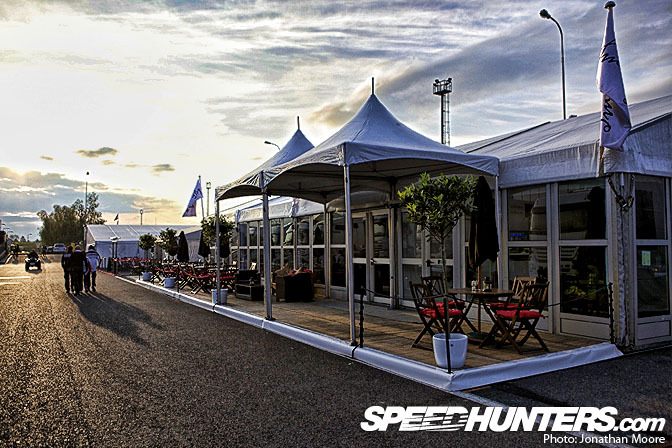 I have the paddock tickets already, looking forward to the race, any chance to get speedhunters stickers? Really digging Jonathan Moore's coverage and photo's, Keep it up. Only two more days. 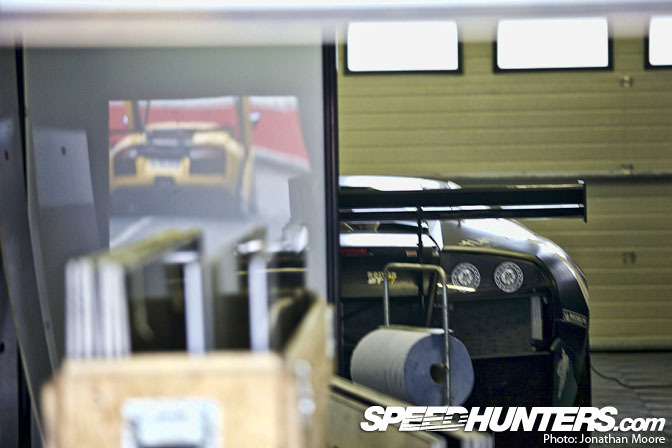 Watch for me on Sunday in Speedhunters t-shirt.